Seven years ago was the last time Federer played the ABN AMRO World Tennis Tournament. Back then, Federer was world number one for a year, and with two grand slams. Since then, he has not played in Rotterdam, has won a total of 16 grand slams, and has held the #1 ranking for 237 consecutive weeks, 285 in total. Now age 30, the Swiss maestro has slipped to #3, but boldly states that he is intent on returning to #1 and his fire still burns. “I’m very happy to be back,” said Federer, who went straight from Rotterdam airport to the Ahoy Stadium for a four-hour stint that included a pre-tournament press conference, a one-hour practice with Juan Martin del Potro, an autograph session with fans, and a meeting with corporate guests. 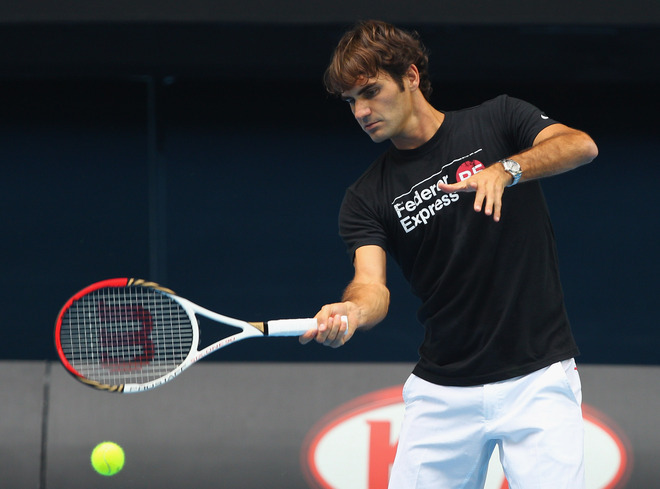 Federer is playing the 39th ABN AMRO World Tennis Tournament in Rotterdam this week. He faces Nicolas Mahut, Wednesday evening. Also in the field are Alexandr Dolgopolov, Feliciano Lopez, Richard Gasquet, Tomas Berdych, and Juan Martin del Potro. Watch full coverage this week of the 39th ABN AMRO World Tennis Tournament on FF07tv.